Actor and former BBC English Repertory Co member with over 20 years' experience of recording for radio and TV commercials, dramas, documentaries, corporate projects and e-learning, Based in London with own studio with ISDN and Source Connect. Description of voice: Clear, well-articulated, friendly and informative. Recorded media I spent 18 months with BBC English Repertory Company at World Service recording dramas, news broadcasts, factual content and inserts for EFL transmissions. I have over 20 years' experience of recording radio and TV commercials, documentaries, corporate narrations, e-learning, etc both in commercial studios and my own studio via ISDN and Source Connect. Acting My acting career spans 30 years during which time I’ve played in theatres across the UK, from Aberdeen to Exeter, Swansea to Colchester and points in between, and across swathes of western Europe. 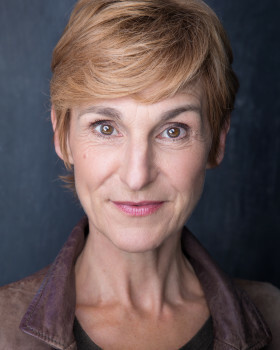 Recent stage credits include Lady Bracknell (The Importance of Being Earnest) and Lady Woodville (The Man of Mode). TV credits include Brief Encounters (with Penelope Wilton), Mr Lincoln The Butcher (with John Henshaw), Wyatt’s Watchdogs and The Bill and film credits include The Hippopotamus (with Roger Allam and Fiona Shaw) and Game Day (with Stephen McGann).